Richmond, Virginia, is the heart of the Confederacy, and for those whose hearts are still with the Union in 1861, it is a trying home. Li8za Van Lew has long been an outsider in Richmond. She never married, and at her father's death, she gave all of her family's slaves their freedom. Her neighbors and friends have begun to believe that she might be losing her mind. But the Rebels don't rust her, and with good reason. Behind a mask of mental frailty and innocence, she has secretly organized and is operating a hugely successful spy ring out of Richmond. The Confederate Army has its suspicions, though they can't ever seem to catch her in the act. But as the war wears on, the danger of being caught grows with each bit of information passed along, with her every secret act of patriotism. The double life of lady and spy wears on Liza. Until the war is over, the secrecy that endangers her and those she has recruited to spy for her will never end. She doesn't know how much longer she can endure, wondering if the next knock on her door might bring soldiers to carry her off to prison. . . .
Richmond, Virginia. The capital of the Confederacy. Here lived one of the greatest threats to the Confederate war efforts. In an unremarkable house on Church Street, Elizabeth Van Lew, a spinster thought to be unconventional, was the center of the Union Army's underground spy network. For the duration of the Civil War, she worked with innumerable agents throughout the city-even in Jefferson Davis's own house!-keeping in constant communication with the Union military command. This is her story. 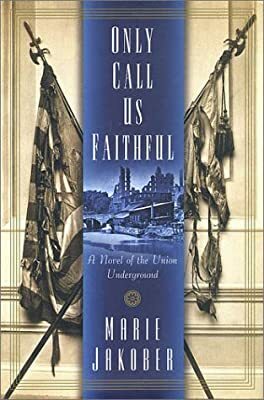 Told by her ghost in a narrative that captures with utter poignancy the contradictions of the Southern ideal and the heartbreak of civil war, Only Call Us Faithful is a remarkable story of courage and conviction, the untold tale of thousands of Southerners who during the Civil War were United Stales patriots in enemy territory. Also dedicated to easing the plight of Union Army prisoners of war incarcerated in Richmond prisons, Miss Van Lew risked life and limb to bring prisoners food and medicine. But though the Confederate leadership in Richmond thought her annoying and inconvenient, they never caught her passing secret information that led directly to Union victories on the fields of battle. To the very end she was invisible, a lady alone, fighting a shadow war that ultimately helped topple the confederacy. An Uncommon hero, her true role has never been fully revealed until now. Using many primary information sources, Marie Jakober has painted a true and vivid portrait of one of the Civil War's most unusual heroes.